The Sennyu Bon Bon Beanie is headgear in Splatoon 2. It is a 3-star item produced by Splash Mob and comes with the primary ability Ink Saver (Sub). It is only available as a CoroCoro Comic promotion in Japan. It cannot be ordered through Murch. The Sennyu Bon Bon Beanie is a black beanie with two lines that change color to match that of the wearer's ink and a white yarn pom-pom on top. It has the Splash Mob icon on the left side and an eye and squid symbols on the right side. The Sennyu Bon Bon Beanie comes with Ink Saver (Sub) as a main ability. As a 3-star item, the Sennyu Bon Bon Beanie has three additional slots for secondary abilities. Since it is made by the Splash Mob brand, it has a higher chance of rolling Ink Saver (Main) and a lower chance of rolling Run Speed Up to fill its secondary ability slots. 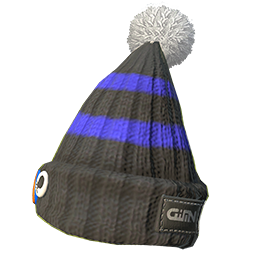 The Sennyu Bon Bon Beanie has a similar look of the Bobble Hat but as a 3-star item. Bobble Hat of the Splatoon manga wears the Sennyu Bon Bon Beanie during the events of Octo Expansion. This page was last edited on 25 October 2018, at 17:07.